It’s the end of an era for the man who holds the world record for Longest Fingernails on One Hand. Shridhar Chillal, of Pune, India, hadn’t cut the fingernails on his left hand since 1952, when he was 14 and a teacher got mad at him for breaking a nail. Chillal decided to see how long he could grow them, even though the Guinness Book of World Records didn’t exist then. The 82-year-old record holder managed to get his nails to grow a collective length of about 29 feet, 10 inches before being officially honored by Guinness in November 2014. But he decided to cut away an important part of his life earlier this week when he flew to New York to have the nails removed by a doctor. The nails are now on display at the Ripley’s Believe It Or Not! Odditorium in Times Square. 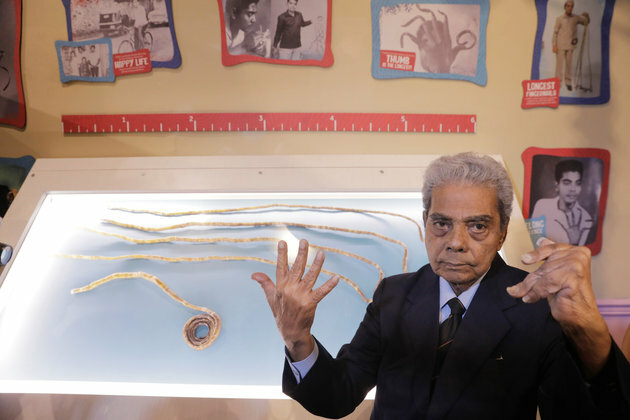 Shridhar Chillal of India displays his newly cut fingernails at an announcement that the five fingernails he grew for 66 years will be displayed in Ripley’s Believe it or Not in New York. There were other reasons why Chillal was willing to cut away an important part of his life: The collective weight of the nails has made it impossible for Chillal to open his hand from a closed position or flex his fingers. Chillal attempted to cut his supersized nails with a manual clipper, but that didn’t work. The doctor used a hand-held power grinder in a process that took about 20 minutes, according to Patch New York. No word on how Chillal is adapting to the lighter load on his left hand, but life just became easier for him in many ways. In 2015, he told HuffPost India how hard it was to sleep with his long nails.